In the burgeoning community of Hamilton Heights this broker-dad is still discovering bunch of awesome ways to keep my 3 and a half year-old daughter entertained, and excited to learn. It’s been a few years, so I thought a reboot of how we enjoy our family time Uptown was long overdue. Especially, since as a parent, my biggest concern is my daughter, growing and learning through love and play. It may be hard to believe, but my Gracie seems to have a whole lot more energy than her old man. Crazy, I know. So we Uptown parents are always exploring different play opportunities. I’ve previously written about one of my go to parks, Riverbank Park (located at W 138th and Riverside Drive) has tons of opportunities for team sports like baseball, softball, swimming, soccer, and football. Not quite sure my little one is ready, but there is talk of an extra little soccer league that we are inquiring about. There are other great parks we go to as well, like Hamilton Park (at 141st and Hamilton Place), which has great big space to run, and have the occasional picnic, or delicious ice cream from one of the many trucks that pass by. Jackie Robinson Park is another great option, with a recreational center that offers summer and after school programs. Once you visit these parks, you’ll notice the the awesome ingredient of the neighborhood parks, are in fact, the neighbors. When there’s seemingly nothing else to do, I know that going to any of these parks we’ll run into a few of Gracie’s friends, and do hours of countless running, jumping, sliding, and safe screaming, aka, screams that happen outside and NOT in our little 2 bed apartment at decibel levels rivaling that of a 757 jet engine. You may not know it, but there is a ton for kids to do, beyond just school and pre-K. As an old musical theatre guy of course we had to start with dance. Well, my daughter had to start with dance (I’m just the guy taking her there). We go to Harlem School for the Arts, aka HSA, located at 645 St. Nicholas Avenue. It has many amazing programs in music, theatre, and dance for ages 3 and up. Gracie is in the 3-4 year old introductory class. The first time she “taught” me to petit jete, my heart jumped. And yes, her first dance recital is coming up. Yikes! She is so excited, and focused when she’s in class. (I emphasize the word “when” in that phrase when she is in class). But there are many great dance studios Uptown as well, like National Dance Institute Center at 217 W 147th St, and Dance Theatre of Harlem at 466 W 152nd St, along with many more. We also found another gem: Sugar Hill Children’s Museum of Art and Storytelling, located at 898 Saint Nicholas Avenue, specializes in tapping into a child’s imagination through art and storytelling. As a guy who once worked as a children’s librarian, I fully appreciate how a mind can be expanded through a good story, or learning how to be creative through art! Admission is FREE for kids 0-8 an you can’t beat that. We watch our little Hamilton Heights native grow much too fast for our taste. She has shot up from a teeny tiny munchkin, to a teenager in a 3 year old body. I know I hoped to be the boss of her til she was six, but alas that battle was lost shortly after my original blog. My daughter has become quite a recognizable character in our community. Her favorite hobby while waiting for the bus, is waving to every single person that passes by. I think she’s already laying down the framework for a city council run. 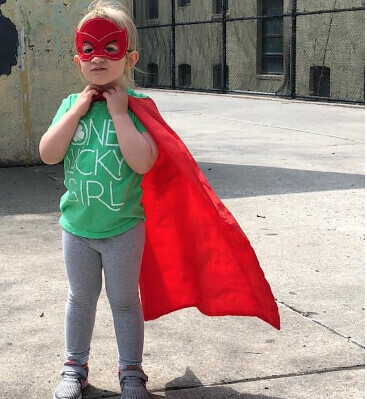 She shows great concern and compassion for all in her neighborhood and I’m so very grateful for this vibrant neighborhood expanding the horizons of my little Gracie. This area is an amazing place to raise a family. I continue to grow through playing with this amazing little person, and spending time with her has taught me so much. The most important lesson: MY TIME WITH GRACIE MAKES ME FEEL LIKE THE LUCKIEST MAN ON EARTH.